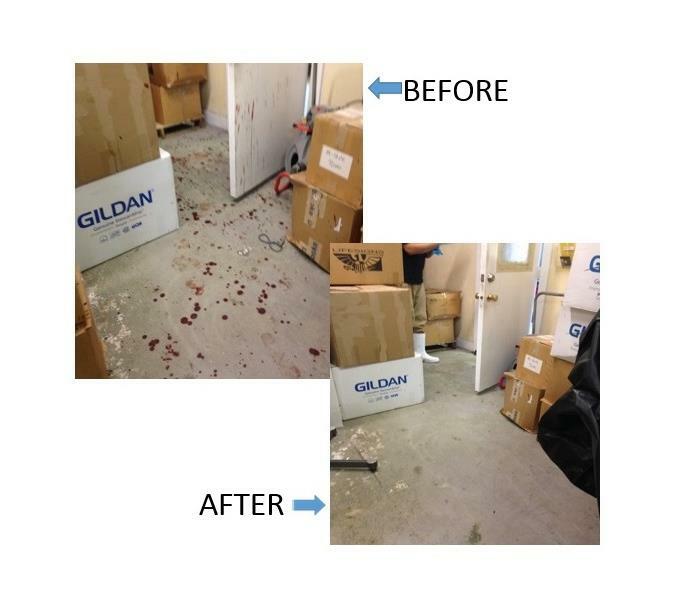 SERVPRO of North Sarasota is trained to safely remove biohazards and dispose of them properly in accordance with OSHA and health regulations. An unexpected loss is not something a family can prepare for emotionally, and it comes with some difficult realities in cleaning up the affected areas. It’s not safe to simply scrub floors or throw away items that have been affected — there’s more to it than just cleaning. Any porous material, including wood, carpet, drywall, or concrete, will absorb body fluids. As a result, you should never attempt to clean porous materials. A bioremediation company can properly dispose of these items for you. Depending on the deceased individual’s health condition, there is potential to come in contact with bloodborne pathogens. While decomposition is perfectly normal, traditional home cleaning solutions are not sufficient to safely clean, sanitize and disinfect areas affected by human decomposition. Even the smallest amount of biological material left untreated can make a residence unlivable. We remove and dispose of bodily fluids, tissue and other potentially pathogenic substances resulting from accident, trauma, crime or death. Trained SERVPRO of North Sarasota Professionals clean, disinfect and deodorize the structure.